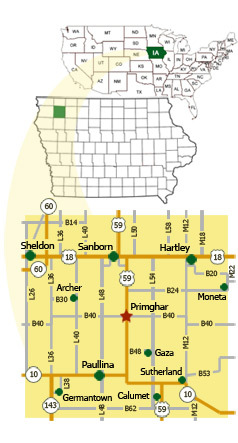 O’BrienAlert is an Emergency Notification System that serves O’Brien County, Iowa. O’BrienAlert will allow citizens to sign up for the types of alerts they would like to receive. Messages can be issued via landline or cell phone, text messaging and e-mail. Messages may contain photo, video and audio attachments to help subscribers better understand the situation at hand, or where to find additional information. Phone calls will come from (712) 555-5555 and text messages will come from 69310. Save both of these numbers in your phone as “O’BrienAlert” so you know when we’re calling or texting you! The O’BrienAlert Emergency Notification System is a part of the Alert Iowa state-wide messaging system, provided free of charge to all Iowa counties by the Iowa Department of Homeland Security and Emergency Management. O’BrienAlert operates using the WENS network provided by Inspiron Logistics. O’BrienAlert is a system that allows a client to immediately send out text messages, voice calls, emails and pages in the event of an emergency or severe weather event. In addition to the opt-in warning notification service, the system has many potential beneficial uses. For example, the system provides the client with the capability to automatically send a recorded voice message to each phone number in the client’s database or to specifically targeted areas identified through electronic maps. The system can also be used for other special messages for which users “opt in” or request notification on certain topics or events. Please note that no communication distribution method is infallible. For that reason, redundant systems of emergency notification, including the outdoor siren system, telephone, e-mail, text messages, and external systems on commercial radio and TV stations or weather radios may be used to send out alerts as soon as possible. 2. How do I sign up or register for the O’BrienAlert? Click the link on this page and enter your contact information. 3. How many phone numbers and e-mail addresses can I register? As many as you need. The system is set up to limit each address to five phone number and two e-mail address registrations, but it is possible to register the address more than once. So, if you have six members in your family and each has a cell phone number, you will have to register your address twice to enter all of the numbers into the system. Please note that the County reserves the right to restrict the number of registrations at an individual property. 4. How do I acquire additional information about O’BrienAlert, report a problem with the system, or get help with my registration? Please e-mail any additional questions or report problems to support@wensnetwork.com or call 866.998.9367. 5. I registered, but I don’t seem to be receiving any notifications. What should I do? Email support@wensnetwork.com or call 866.998.9367. We can help investigate what issues might be occurring and resolve the problem. The most likely problem is that there is a block on your phone number by your carrier to receive messages from shortcodes. 6. Is there a charge for registering to receive messages through O’BrienAlert? NO, this is a free service provided by O’Brien County Emergency Management and the Iowa Homeland Security & Emergency Management Department. Your cell phone provider may charge you for receiving text or phone messages, however, if that is part of your plan with your provider. If you are concerned about being charged for a voice or text notification, check your service agreement with your wireless carrier for details. Service costs from your cellular provider are your responsibility. 7. What type of notifications will I receive? Everyone in the service area, whether they register in the system or not, can receive notification of significant public health and safety events or hazards to their home phone number provided it is publicly registered. 8. I do not have Internet access, how can I sign up to get O’BrienAlert voice messages to my phones? You may call 866-998-9367, and we can help you register. 9. Does O’BrienAlert sell the phone numbers? Will registering for this system cause me to get more marketing calls or spam e-mails? ABSOLUTELY NOT. Your registration information is private and will not be shared. Neither the County nor the third party provider will sell or provide the registered phone numbers or e-mail addresses to any other vendor or service. 10. How do I unsubscribe? I do not want to receive notification messages anymore. At any time, you can simply return to the registration page via the registration website to unsubscribe. Click “Unsubscribe” at the bottom of the page. The system will then ask you for a phone number or e-mail address to unsubscribe. Enter the phone number or e-mail address you wish to unsubscribe and hit “unsubscribe”. 11. How do I update my information if my e-mail address, cell phone number, or other information has changed? If your contact information has changed, follow the instructions above to unsubscribe the information that has changed. You must then register again with your new contact information. 12. How do I switch a phone number from receiving a text message to receiving a voice call or vice versa? This is the same as changing contact information. You must follow the instructions above to unsubscribe the phone number and then you must re-register the number requesting the alternate notification method. 13. How do I switch a phone number from being part of an “opt-in” group for which I previously registered? This is the same as changing contact information. You must follow the instructions above to unsubscribe the phone number and then you must re-register the number selecting the groups in which you want to remain. 14. Exactly what phones will be able to receive these voice notification calls? All voluntarily registered cellular phones, including private numbers. All registered landline phones and landline phones in the 911 database, including unlisted numbers. All voluntarily registered VOIP phones, including unlisted numbers. 15. Can O’BrienAlert use the public database to have the Notification System call me on unimportant matters? NO. Regulations exist that limit our ability to send calls to numbers in this database unless it is a public health and safety issue, as determined by the County. 16. Will O’BrienAlert work if there is a power failure? Generally Yes. Inspiron Logistics maintains multiple call centers across the nation so if one goes down, the service is still maintained. 17. Will all cellular phone carriers deliver O’BrienAlert messages? Yes, the O’BrienAlert service provider works with all major cellular phone providers and is simply placing a call to your cell phone as would any other person. As with all cell phone calls, signal strength and other issues with your carrier could impact delivery of the message to your phone. Text messages, if selected as an option, will be sent to your carrier for delivery to your phone. Each carrier establishes its own protocols for delivery of text messages, so it is possible for text messages to be delayed. 18. Will I receive ads or Spam on my phone? No. Inspiron Logistics, the company behind O’BrienAlert does not tolerate spam text or e-mail messages. Inspiron Logistics maintains an anti-spam policy as part of the compliance to operate with Tier 1 provisioning with all of the major North American carriers. Tier 1 provisioning is only granted to top emergency officials and the O’BrienAlert system (Inspiron Logistics product name). This means that when the mobile networks are completely congested, the only messages allowed to go through are those with Tier 1 provisioning as a matter of priority. 19. I don’t use text messages. Can I receive O’BrienAlert notifications by e-mail? Yes. When you sign up online, fill in your e-mail address in the proper field. You will be sent your emergency notification through the e-mail address that you registered. 20. Can I register a phone number outside of the service area? Yes. For example, a business owner in O’Brien County may list their O’Brien County business address but list a home phone number in Clay County if they wish to be notified of a significant event that puts their business location at risk. Registration works the same when you list a phone number outside of O’Brien County. 21. Can I register an address outside of the service area? The system is not intended to include addresses outside of the service area. The mapping technology that reads addresses focuses on the service area addresses. Service is not intended nor guaranteed for addresses outside of the service area. 22. Why does O’BrienAlert send text messages? Text messages are simply an option in today’s society. Many people prefer to receive text messages as compared to voice messages. The system does limit text messages to fewer characters, so the notification provided may be briefer or more limited than a voice message. Each person is encouraged to sign up for the method or methods that will most likely ensure they receive the message. Note that you can enter the same cell number in twice and have it receive both a voice and text message. 23. After I received a voice message notification the system asked me to “Press 1 to acknowledge receipt”. Do I have to press 1? No, but we hope you do! Acknowledging receipt of the message doesn’t impact your service or mean you will receive more calls later. It simply allows the County to track the use and effectiveness of the system. Acknowledging the call enables the County to see how many calls are going through and if the calls are being listened to. The information we get from evaluating the system may enable us to improve the system. 24. How can the system call everyone in the service area at once? It doesn’t call everyone at once because the individual local phone carriers can’t handle that many calls at once. The system is set up to place around 300 calls at a time. This number will be evaluated overtime as we monitor the capacity of the phone companies. 25. Will O’BrienAlert be periodically tested? Yes, tests are possible. O’BrienAlert will monitor the results of each notification issued and determine if there is a need to test the system to verify subscriptions to this system and to ensure the system is working properly. O’BrienAlert will avoid unnecessary tests, but will perform tests if determined that it is necessary for the integrity of the system. 26. Can I unregister from receiving notifications of significant public safety hazards or events that are issued using the 911 database? Yes, O’BrienAlert does allow an individual to be removed from the system entirely but strongly discourages any individual from taking this option. Such notifications are very rare but can be vital to ensuring your safety. For example, notifications cover events such as a need to boil your water due to a problem with the water system, a need to evacuate due to a chemical spill or other event, Emergency Declarations, or prisoner escapes. Such events almost never occur, but preparation and NOTIFICATION is the key to avoiding significant loss or tragedy. The County, therefore, strongly encourages individuals NOT to remove their name from the O’BrienAlert copy of the 911 database.